It's a Survival Seeds Giveaway! It’s a Survival Seeds Giveaway! So, you longtime readers of The Greenest Dollar have probably heard of Hometown Seeds before. They sponsored an awesome giveaway last year, and I also used their Survival Seeds in last year’s garden. 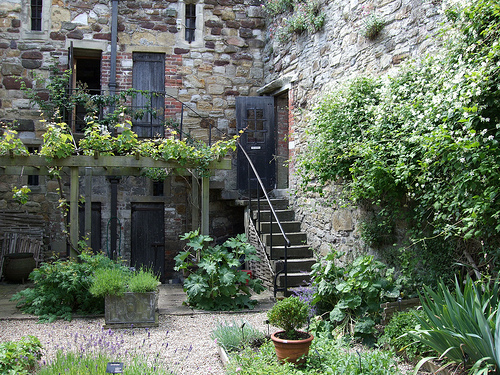 Sadly, no, that picture on the left is NOT my Medieval herb garden. Mine was far more romantic and mysterious looking than that one. Anyway, the Survival Seed plants I managed not to kill due to my inexperience thrived incredibly well last year. And I was able to harvest a lot of seeds for this year’s garden. Trust me when I tell you I’ll have an influx of Lincoln Peas come July. Well, Scott over at Hometown has graciously offered to sponsor another giveaway here. Lucky you! First, if you have no idea who Hometown is, or what Survival Seeds are, here’s a quick rundown. Hometown Seeds is an online seed business that rocks. And they sell high-quality seeds…everything from flowering perennials to Seed Banks containing over 24,000 seeds. One of their most unique products are their Survival Seed Packs. Survival Seeds are seeds that you can harvest again and again. See, 99% of the time when you buy a packet of seeds, you’re only going to get one growing season out of them. The seed companies did this so you’d have to keep buying seeds year after year, which means they make more money off of us. But Hometown Seeds sells Survival Seeds. These seeds produce plants whose seeds can be harvested for next year’s crop. So, no more buying seeds! It’s really cool, and definitely worth the money to invest in Survival Seeds. Each pack has a shelf life of 5 years (10 years if frozen). And, you get over 22,000 seeds. The contest will run from Monday, January 3 through Saturday, January 8. I’ll pick two winners on Monday, January 10, using Random.org. How can you enter? Super easy. 1. Visit HometownSeeds.com. Take a look around. Come back to this post and let me know which flower or vegetable you’d most like to plant this year. 3. Spread this contest on Facebook. Leave a comment letting me know you spread the word! Every comment counts as an entry! i want larkspur as an annual to help embellish my perennial garden i planted last year! I also shared on my Facebook page 🙂 Ive converted quite a few apprehensive souls into green thumbs so Im sure theyll be as excited as I am for a chance to start their garden off with free seeds! Zucchini! I love it (especially grilled) and ours wimped out after producing about 5 last year… so I’d really like to make sure we get a good bunch this year. I’d be interested in trying the Lincoln peas but any type of peas get eaten around here, including the sugar and snow. Definitely the sweet big red peppers – I love them, but they’re so expensive to buy! Along with the survival seeds, I would love to plant some Oriental Poppy’s. Thank you for an awesome giveaway! I would like to try growing (and eating) the chard. I know, I am probably the last person on earth to try it, but that is what I would like to try. I twittered this (bobster126) and also posted on Facebook. Thanks! I’d like to plant the Sugar Buns Hybrid corn seeds. If my husband had his way, I wouldn’t plant any other vegetable seeds – he just loves his corn. I want to successfully grow beets this year…I love them roasted up with some maple syrup but last year my beets got attacked early on by some nasty beetles!! My birthday is January 10th so what a cool birthday gift that would be if I won!!! What a cool site. I would pick asparagus because they look difficult to grow. I’m already awaiting seed catalogs and this would be so cool to win!! I don’t think I could choose just one! But if I had, I would like to try the Little Marvel Peas but then I saw the other posts for chard, sugar buns corn and I’m going to have try them as well! I added it to my facebook page! I would plant the Hollyhocks. I’ve always wanted some in my flower garden. What are the steps to harvest the seeds for another year? Here is what I just ordered from Hometown Seeds! These Broccoli and Radish sprouts are unbelievably delicious… and a great way to garden in the winter… Anyone can put a jar or two of sprouts in the kitchen and enjoy fresh greens even when the ground outside is frozen… I’m just saying!! I want cilantro!! For all that guacomole! YUM YUM!! I want to plant some Oriental Poppies, so so beautiful. Im so excited! I was just about to order their Survival Seed package today,when I saw this post. Now I will wait till Monday. I would love to plant the Brandywine Tomatoes and Amish Paste. Hope I win one of these, but if not, I will continue with my order. Roma VF Tomato Seeds for sure. Love to cook with Romas! I’m very interested in the survival seeds package, as it is hard to buy any seeds that are not a hybrid these days. So many seeds to choose! I’d love to see if I can successfully grow tomatoes and lettuce this year. The package would give me the boost to try again. Fairy Tale Eggplant. My favorite vegetable. So pretty too. I’d like to grow *every* vegetable! Okay, not really practical, I guess. Push come to shove, I’d have to go with either the pink Brandwines or the Black Beauty eggplants–I love them desperately and can’t imagine having too many of them. I’d like to plant rutabaga seeds. I would love to try the cantaloupe seeds because my sons love to eat the fruit with yogurt in the summer. The Sweet Pea Knee Hi Mix looks beautiful. I love sweet peas, and the bush type would look beautiful in front of my kitchen window. The cantaloupe seeds look great – my kids love the fruit with yogurt. And the Sweet Pea, Knee Hi Mix would look gorgeous outside my kitchen window! I’d love to try some beets, basil and poppies in our mountain garden! I would most like Utah Yellow Sweet Spanish Onion. Thanks for a great contest. Keep up the good work. I would like the Wheat, Hard Red Organic Sprouting Seeds. They sound great! I’d love to try the gourmet lettuce mix. There’s nothing like picking your dinner salad out of your own garden. Thank you for your latest wonderful find (or at least new to me!). I will spread the word throughout my circle, but do not Twitter. The Survival Seeds are a WONDERFUL idea. My fiance and I are avidly working toward self-sufficiency in the event of misfortune/disaster, and it had never occurred to me to have a Seed Bank! Thank you and thank you to Hometown Seeds. I wish you a happy and healthy New Year! I have been having horrible luck with my gardening. Apparently I have a black thumb and I am only using container gardens! (Earthboxes). I guess the seeds I have gotten have not been good ones. I even tried Seeds of Change. I actually have planted pea seeds that are growing, but should have sprouted a pea by now and I only have 5 foot tall growths! All of the seeds at this website look great. I think I will be ordering from them now to see if I get any better luck. Thank god we are not trying to live off my growing techniques as we would have starved along time ago. By the way, I think your articles are great! I got my seeds and I can’t wait to plant them! A good friend of mine is going to grow some in her garden while I grow some in mine. We are going to start canning and preserving these veggies together. Thanks again for a great win! I’m planning on ordering some flower seeds in the spring as well!